Why Is My Car Telling Me To Get Coffee? Mercedes-Benz is using technology to prevent driving dr... Mercedes-Benz is using technology to prevent driving drowsy (Sharon Carty, AOL Autos). I'm not sure what made me decide to send my 11-year-old to camp 4 ½ hours away, but it seemed like a good idea at the time. But that meant 9 hours of driving two weekends in a row. Throw in a touch of insomnia, and the whole plan became a bit of a mess. Especially since I had to get up early on Sunday morning to make the noon pickup time later that day. I was test driving a pretty sweet Mercedes-Benz E550 sedan that weekend. The adaptive cruise control made the ride easier. Put the car in cruise mode, and it takes care of slowing itself down when it senses cars ahead (no tailgating), and speeds back up when the road becomes clear. Combine that with heated and massaging seats, and the drive almost resembled a spa treatment. I could get used to this. The reunion with my daughter was great. She had entertaining stories to tell on the ride home and a couple of campy songs to sing. But about halfway home, she dozed off. It got a little quiet, and I cocked my head to the left. I didn't feel sleepy, but about ten minutes later I noticed something on the dashboard: A coffee cup and the message, "Time For A Rest?" Huh? Is it telling me there is a Starbucks at the next rest-area? Some crazy ad inserted onto my dash? Actually, my car is looking out for me. What a lovely car, I thought. While massaging my back, it was also worried that I was tired. More considerate than some guys I've dated. I stopped and got a diet Coke, and stood outside the car for a bit until I felt more awake. I also decided to turn off the back massager and seat heater, because they were making me a little too comfy. Mercedes' Attention Assist technology helped me avoid one of the most dangerous driving behaviors: Driving drowsy. According to the National Sleep Foundation, 100,000 accidents a year are caused by drowsy drivers. Once the system "knows" how you drive by collecting data in the on-board computer, it can tell when you've started behaving a little erratically. If you are driving between 50 mph and 112 mph, it can notify you when you've begun behaving like you're tired. 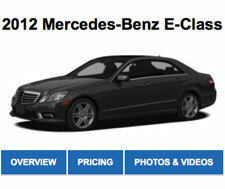 The technology is standard on all E-class and CL-class vehicles, as well as V-8 and V-12 powered S-class vehicles. But you don't need to have $50,000 to spend to get drowsy driving technology. Saab has a driver attention warning system, which uses cameras to detect eye, eyelid and head movement. Other automakers offer lane departure warning systems that alert drivers when they are swerving out of their lanes. And there is a $250 device drivers can mount on their dash to let them know when they are getting sleepy. Danish company ASP makes the Anti-Sleep Pilot, which uses a questionnaire to determine your risk profile, then monitors your driving using sensors measuring 26 different factors. It also requires drivers to tap the top of the sensor every 10 or 15 minutes, and judges your reaction time. If you don't react quickly enough, it turns red, alerting you it's time for a break. The ASP is currently not available in the U.S., but could be available in the next two to three months. Bottom Line: Drivers are often too busy or short-sighted to stop driving when they are drowsy. But, given the the huge numbers of people killed or hurt every year from sleepiness behind the wheel, technology that prompts us to get off the road seems like a good idea.